The Visual Science Lab / Kirk Tuck: File Delivery Methodology as Prescribed by The VSL Official Manual. Simple and Clear is Best. File Delivery Methodology as Prescribed by The VSL Official Manual. Simple and Clear is Best. Life can be skittish and unwieldy but your delivery of images doesn't have to be. In days of yore we delivered fiber-based, paper prints, then we delivered glossy RC prints, then we delivered transparencies (for a long, long time), then we delivered removable magneto optical drives, then Zip Drives until CD-roms came along and we used them for file delivery until the benevolent universe gave us DVDs. But then Apple decided that DVDs were passé and we decided to get a bit ahead of the fact that very soon the vast majority of art directors we worked with would no longer have a way to look at images on DVD and we decided to head over to the magic land of memory sticks (aka: flash drives). But unlike DVDs and CDs there's damn little clean surface to write notes upon. No place on the sticks to put things like job descriptions, dates, provenance, attributions, logos and other exciting information. I had been delivering the sticks in envelopes and writing all of the pertinent information on the envelopes but very quickly the envelopes get separated from the sticks and the clients look into their drawers and see vast numbers of undifferentiated plastic memory sticks with ubiquitous USB connectors and throw up their hands in dismay. While they could just pop in one stick after the other until they find the one they need they seem to default to just calling up and asking for another memory stick. Happens all the time. I decided I would give each innocent, little memory stick a fighting chance at usefulness and survival. I stopped using the envelopes and headed to the office supply store to buy these shipping tags. They are big enough to write on and if you run out of space on one side you can flip them over and continue writing on the other side. The hope is that my client will keep the tag attached long enough to actually complete the job without coming back for a second servicing of small plastic devices. We generally buy the sticks in 16 and 32 gigabyte sizes because I shoot too much. The prices have fallen in the last year and we are now paying around $7.50 for a Sandisk Cruser 16 GB stick. That's what the 8 GB sticks cost us last year. The 32 GB sticks are more expensive but much cheaper and easier than trying to source small hard drives. The process is much quicker for me than the arduous process of splitting folders into 4.4 GB sizes and burning the client a set of disks. On the job I shot last Saturday I ended up with about 15 GB of images. It would have taken four DVDs to hold the work. And the split up files make for more work on the client end. The job from the Sunday-Weds. of last week fit nicely on a 32GB stick. I see these devices as strictly one time use products. I never expect or ask for clients to return them. That adds value for the client as they now have a new memory device to play with once they've downloaded the files onto their company servers. This makes everyone happy. None of this is rocket science but I do like the tags. They are both practical and sufficiently retro to be cool. A box of 200 tags, with strings attached, it about $6. Much cheaper than a box of DVD covers. Somehow it all comes out in the wash.
To the people who will chime in and ask why we don't just use WeTransfer, Dropbox, and FTP in general I would say that their are limits on size, time and client admin permission rules. We FTP tons and tons of single images or low quantity images. It's much easier for a client to receive 4,000+ images on a memory stick than it is for the same client to download them. And they hold in their hands a backup device in case the server goes belly up. When a job exceeds 32 gigabytes of space for the deliverable, as in the case of some video projects or longer duration still projects we still default to bus powered HDs. But it's only a matter of time until USB3 64GB thumb drives come down enough in price to make them the future inflection point. Yep. That's how the VSL manual tells me to do stuff, and who am I to argue with the manual? The shipping tag is a great idea. I started adding a small readme.txt file to USB sticks and memory cards with my contact details and a basic copyright statement. It only takes a few bytes and at least gives the finder a fighting chance of finding me if I drop or misplace one. The shipping tag is one additional help for USB keys, and is immediately visible. This is really a great idea. Thank you for sharing. F---ing brilliant. Love it. Thanks for sharing. 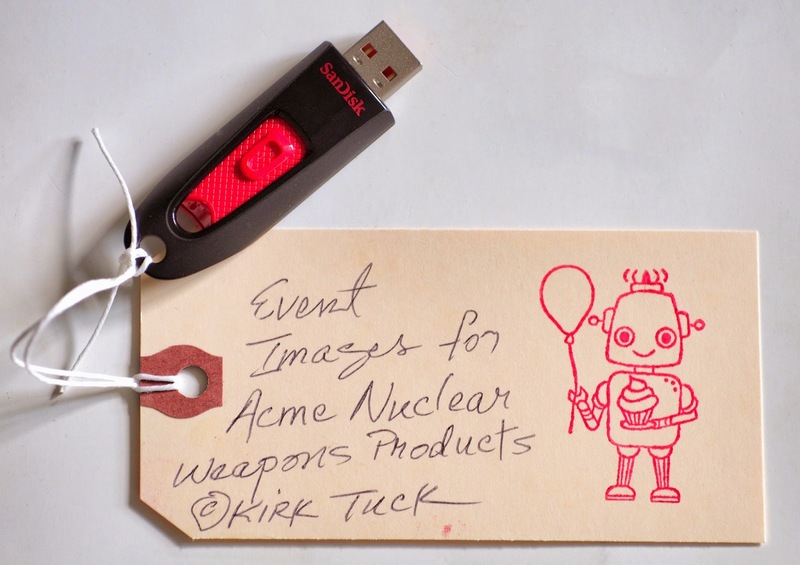 There are people who are using thumb drives as their business cards, with their details printed on the case and this is now moving to business cards that have integrated USB memory: http://www.smh.com.au/digital-life/digital-life-news/here-take-my-business-card-with-builtin-usb-drive-20140812-1030wx.html. There are other types already available. Do you send your clients each image in full size file, or do you send smaller and quicker downloadable files on the memory stick to facilitate ease of downloading, viewing and selecting at their end? Just curious. We would like to thank you for your recent fantastic work that highlighted all the fine weapons we produce here at Acme. This is just a quick note to tell you we were able to secure our largest contract to date by virtue of the great videos and photographs you made of our products. The Will E Coyote company placed an order that will likely keep us busy until the foreseeable future. You will be hearing from us shortly for some extensive follow up work. Sometimes a simple idea is a great idea!